A review of The Power and Politicized Expansion of the International Criminal Court, by Barry M. Hashimoto. Barry Hashimoto’s dissertation is a welcome addition to the scant literature considering the reasons why states and their leaders commit to the International Criminal Court. Created by treaty in 2002, the court is tasked with holding accountable individuals who have committed mass atrocities: it may prosecute “political and military elites for common tactics and byproducts of war and repression—murder, torture, disappearances, sexual violence, force population transfers, and child soldiering, for instance” (p. 1). Indeed, the treaty grants the ICC unprecedented powers to pursue indictments and convictions—even of heads of state. As Hashimoto points out, states that join the court expose their nationals and others who enter their territory to prosecution. To the extent that the state itself fails to prosecute, the court can take referrals of situations from states, the Security Council, or the prosecutor. The term “situation” refers to the court’s power to investigate the whole of a matter: to conduct an open-ended investigation that may focus on any or both sides to a conflict. Moreover, when states join the ICC, they must do so without also interposing reservations, and although they may later exit the treaty, doing so will not halt any ongoing investigation. The puzzle Hashimoto addresses is why so many states and leaders have decided to join the court and subject themselves to its very significant powers. He notes that the court counts among its membership some sixty percent of the world’s states, including some whose leaders could well expect they or their citizens might commit the kinds of acts that would gain the ICC’s attention. For example, Kenya joined the court. Its citizens have since been subjected to an unwanted ICC investigation and prosecution. The Central African Republic, the Democratic Republic of the Congo, and Uganda also accepted the court’s jurisdiction. Unlike with Kenya, however, the leaders of those states sought out the ICC and successfully petitioned it to investigate the acts that occurred during wars fought by their subordinates and proxies. In his dissertation, Hashimoto offers a novel argument about why some leaders who might have reason to fear the court and its powers might nevertheless choose to join the ICC. He argues that some leaders join because the ICC offers the potential benefit of marginalizing their political competitors: “leaders trade off the ICC’s potential to destroy their own political careers in unwanted prosecutions against the similar threat that the court poses to contenders for office and the foreign patrons of domestic enemies of the state” (p. 6). How can the court damage political careers? Hashimoto acknowledges that neither the ICC nor the other international criminal courts are always able to arrest the individuals they indict. On the other hand, Hashimoto marshals evidence to show that even an ICC indictment can issue a credible signal about personal guilt for atrocities. That signal then can trigger “leader-specific sanctions by wealthy donor states that prefer to keep politicians who commit atrocities out of office” (p. 57). For the incumbent leader, the hope is to limit self-exposure so that the ICC ultimately decides to indict the incumbent’s political opponent, thus marginalizing the opponent and simultaneously extending the incumbent’s time in office. Hashimoto’s argument builds on and adds to the literature on international relations theory seeking to explain why states create and commit to international institutions, with a particular focus on institutions designed to deliver justice. His literature review provides a detailed account of the main theories that have been advanced to explain the creation of and commitment to the ICC and the studies that have empirically tested those theories. For example, according to the principled-justice theory, states act in accordance with a logic of appropriateness and support the ICC because doing so is the principled reaction to injustice. Empirical evidence supports this theory, demonstrating that democracies, states with better human rights practices, and those with a stronger commitment to the rule of law are all more likely to commit to the ICC. In fact, Hashimoto’s empirical evidence similarly supports this theory in that he, too finds that democracies and states under a greater rule of law are significantly more likely to ratify the treaty creating the ICC than are autocracies or states demonstrating a lesser respect for the rule of law (p. 85). It is with respect to non-democracies where Hashimoto’s theory about commitment comes into play and where he argues that existing theories are lacking. One such existing theory is the civil-peace perspective advanced by scholars Beth Simmons and Allison Danner who argue that the ICC offers non-democracies with a recent history of civil war an opportunity to credibly commit to tie their hands to “good behavior when domestic institutions are too weak or corrupt to do the job” (p. 40). Under that theory, commitment ties the hands of not only a leader’s political opponents, but also the leader who risks being punished by the ICC should s/he respond violently to threats. Simmons and Danner found empirical support for their hypothesis: autocracies experiencing recent civil conflicts were more likely to ratify the ICC than autocracies experiencing peace. However, Hashimoto notes that when scholars Terrence Chapman and Steven Chaudoin and Chapman extended the analysis to encompass additional time periods, the results showed that a history of civil war did not predict whether an autocrat was more or less likely to ratify the ICC treaty. How exactly does Hashimoto’s theory come into play? He suggests that perhaps not all autocrats who have reason to fear the ICC commit so as to send a credible signal about their intention to comply. Rather, they may intend to continue their own bad practices, but seek to use the ICC as a sword against their enemies. To the extent that they can use their own powers to keep from being the subject of an ICC indictment—for example by destroying physical evidence (p.44)—then the ICC is an ally they can use as a threat against their enemies (p. 66). In short, “breaking commitments to the Rome Statute and the ICC may be cheap, and in that case, ratifying the Rome Statute may not entail a state’s credible commitment to anything” (p. 45). In Chapter 3, Hashimoto expands on his theory of ICC commitment behavior and generates hypotheses to examine empirically. His theory is that “[l]eaders trade off the risk of unwanted prosecutions against the deterrent threat that an ICC prosecution poses to political rivals and patrons of domestic enemies, who may conspire to violently oust them” (p. 57). For commitment to pose such a risk and concomitant threat through, Hashimoto explains that the court must be able to credibly communicate guilt for atrocities—thus, leading to sanctions against the guilty imposed by the wealthy donor states “that prefer to keep politicians who commit atrocities out of office” (p. 57). Hashimoto suggests that when the ICC indicts, this sends a credible signal of guilt for several reasons. First, the ICC operates according to accepted and legitimate standards regarding the investigation and collection of evidence. Second, the ICC has significant powers and money that enable it to thoroughly investigate and gather evidence before reaching conclusions about likely culpability. Third, the ICC is staffed with judges who presumably seek to demonstrate professional competence, such that they will be unlikely to recklessly approve indictments. Chapter 3 also elaborates on Hashimoto’s argument about the sanctions that may follow an ICC indictment. He argues that to retain the support of domestic political elites who help keep them in office, leaders are expected to be “breadwinners” and that one “significant source of the capital that domestic elites expect leaders to raise comes from” foreign aid and loans from rich democracies (p. 58). Indeed, Hashimoto references studies that show foreign aid and loans extend leaders’ tenure in office. On the other hand, he argues that the voters in those rich democracies will want to sanction, rather than reward, leaders who are guilty of atrocities. ICC indictments can identify such leaders, thereby “influenc[ing] the opinions of enfranchised constituencies of wealthy industrialized democracies—states providing large sums of capital to poorer states,” (p. 69), which in turn can lead to sanctions and ruined political careers for the indicted (p. 69). Chapter 3 concludes with the hypotheses Hashimoto uses to test his theory. Because the incumbent leader faces a risk of ICC prosecution, Hashimoto predicts different commitment outcomes for “accountable and unaccountable” leaders who depend on capital inflows from the world’s major donors. Leaders who are accountable to the public—democrats—cannot have the same assurances that an ICC investigation will not focus on them rather than their opponents and are thus neither more nor less likely to ratify the Rome Statute. Unaccountable leaders—autocrats—are those who are most likely to commit to the court because they are most able to use the state machinery to evade an ICC prosecution by hiding evidence or intimidating witnesses. For these unaccountable leaders, Hashimoto further hypothesizes that commitment should help the leader experience “a smaller risk both of losing office and of facing anti-regime violence than s/he would have otherwise” (p. 70). Chapter 4 describes the empirical tests and results for the hypotheses about commitment to the ICC “with panel data on 579 national leaders who held office between 1998 and 2008” (p.75). Consistent with his theory, Hashimoto found that “receiving larger amounts of development capital from the liberal foreign-aid regime” made the unaccountable autocrats—but not the accountable democrats—more likely to commit to the ICC (p. 75). He found this effect in four of five models, each of which used a different measure for the state’s receipt of development capital (p. 84). Hashimoto also found more generally that for states under the ICC’s jurisdiction, a leader had reduced risk of losing office or having a civil conflict. Hashimoto expands his proof in Chapter 5 with empirical tests specifically directed at testing his argument about the negative signaling effect of an ICC indictment: namely that such an indictment communicates guilt, which in turn leads to sanctions from wealthy donor states that prefer to keep those who commit atrocities out of office. Here, Hashimoto’s data is limited since only a handful of incumbent leaders have been the subject of indictments issued by the ICC or another international criminal tribunal. Nevertheless, the results do support a conclusion that such indictments have a sanctioning effect. For example, the indicted leaders were quickly forced out of office and domestic production also rapidly declined post-indictment. How does Hashimoto show that the indictments were the most likely cause producing the sanctions? First, he compares the effect of an international criminal indictment to the effect on tenure resulting from a domestic human rights trial and shows that the effect from the former is larger than the latter. He also shows that the existence of data showing a state tends to abuse human rights is not a significant predictor of whether the incumbent will exit office. Similarly, Hashimoto shows that while a domestic human rights trial and the existence of human rights abuses negatively affect domestic production, their effect on GDP is less than that of an international criminal court indictment. The empirical evidence did not support Hashimoto’s hypothesis that international criminal indictments would reduce foreign aid directed towards states whose leaders were indicted. But he offers a persuasive explanation for the unexpected result: leaders were forced out of office so quickly that states had no real time to respond since foreign aid commitments are made at least a year in advance (p. 111). The chapter concludes with additional proof using case studies describing the how indictments of incumbent leaders in Serbia, Bosnia and Herzegovina, Liberia, and Sudan affected leader tenure, domestic production, and foreign aid. In Chapter 6, Hashimoto offers a thesis about the timing of the ICC’s appearance—a theory that ties in with his theory about why some leaders might commit to the ICC. Hashimoto begins by recounting what he calls the “orthodox history of the ICC” (p. 125). According to the orthodox history—premised on the political culture theory and the persuasion theory addressed by Hashimoto in Chapter two of the dissertation—“a transitional advocacy network of NGOs, consolidated democracies, and democratizing states achieved a vision of multilateral, institutionalized, international criminal justice” (p. 125). Hashimoto does not seek to discredit the orthodox history, but he argues that it does not explain why the court was created after the Cold War, and not before or why autocrats would lend their support to it. To explain the court’s post-Cold War creation, Hashimoto references “the changing nature of development finance and civil war” (p. 135). In the 1970s, wealthy liberal democracies began disbursing increasingly large sums of development capital. After the Cold War, civil war became associated with more organized and resilient rebels. In addition, states and NATO began intervening more frequently in civil wars, a fact which meant that sometimes incumbents could not achieve a decisive victory. As a result, suggests Hashimoto, states and their leaders began experiencing more of a threat from their non-state enemies. Thus, Hashimoto puts the commitment decisions of autocratic states in historical context, explaining how the realities of a 1990s world could cause them to back the creation of a strong international criminal court—one that could punish their enemies with the help of a foreign-aid regime that “would lend teeth to the court” (p. 137). This dissertation is an important contribution to the literature examining state support for the creation of, and commitment to, the International Criminal Court. Hashimoto offers a novel theory for why autocratic leaders might commit to the ICC, and he supports that theory with rigorous empirical testing. Consider but one implication of his findings: that “when corrupt or weak domestic institutions fail to credibly commit governments to humane governance and obedience to international law, they will also fail to constrain governments from sabotaging oversight by international institutions tasked with monitoring and enforcement” (p. 145). His theory and his findings should be of interest to those studying the ICC, as well as scholars of international relations more generally. James T. Laney School of Graduate Studies of Emory University. 2012. 175 pp. Primary Advisor: Dan Reiter. 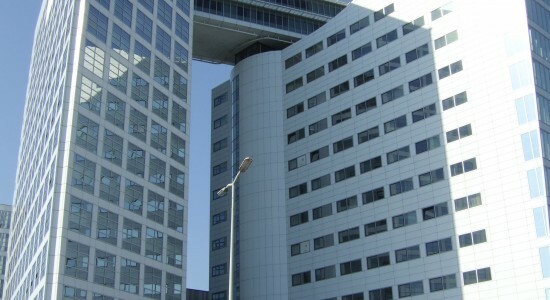 Image: The building of the International Criminal Court in The Hague, Netherlands, Wikimedia Commons.